Please refer to our stock # 2016 when inquiring. 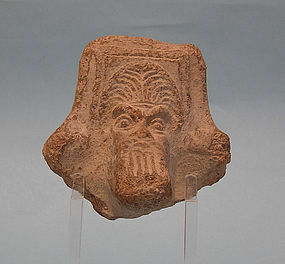 Hellenistic Terracotta Brazier fragment of a Head of a Bearded Man found in the Holy Land. Protruding beard and short hair, heavy lidded eyes under arching brows with missing nose. Fragment in good condition. Circa 4th - 2nd B.C.E. 3 3/4" high. On Custom lucite stand. Ex: Archaeological Center, Tel Aviv. A brazier is a container for fire, generally taking the form of an upright standing or hanging metal bowl or box. Used for burning solid fuel, braziers principally provide heat and light, but may also be used for cooking and cultural rituals. Braziers have been recovered from many early archaeological sites, for example the Nimrud brazier recently excavated by the Iraqi National Museum, which dates back to at least 824 BCE.